There’s thunder and lightning and pouring rain when we leave Paris at 9 am but after 3 hours driving east, the weather improves immensely and by the time we reach Germany, it’s an incredible 31°C and the sky is an intense blue. Now, that’s what I call holiday weather! 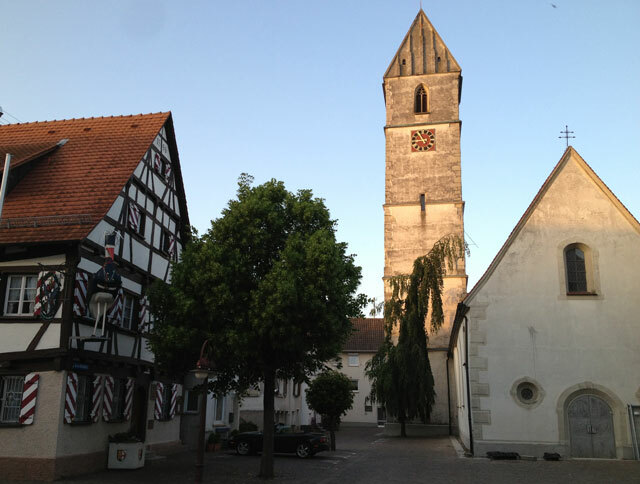 We come round a bend and see a shining white bulb that turns out to be the cathdral of Zwiefalten completed in 1750. We have a cold drink at the bar opposite and visit the beautiful baroque interior just before it closes at 6 pm. 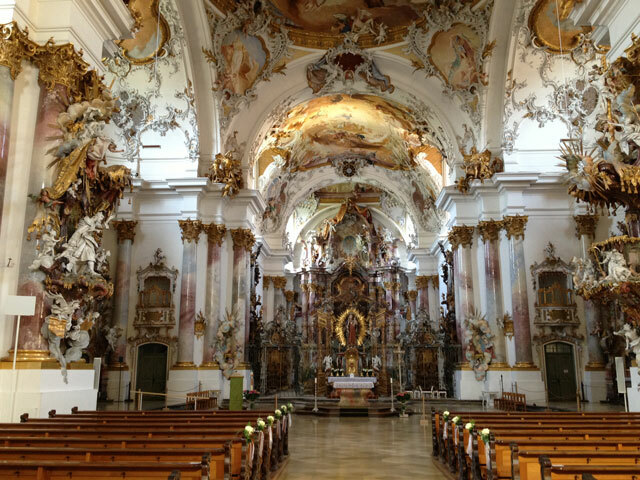 It reminds us of the first time we saw a rococco interior in Germany. It was the Pilgrimage Church of Wies at the foothill of the Alps and we walked for hours up a hill. It was very plain from the outside, but the inside was extraordinary. 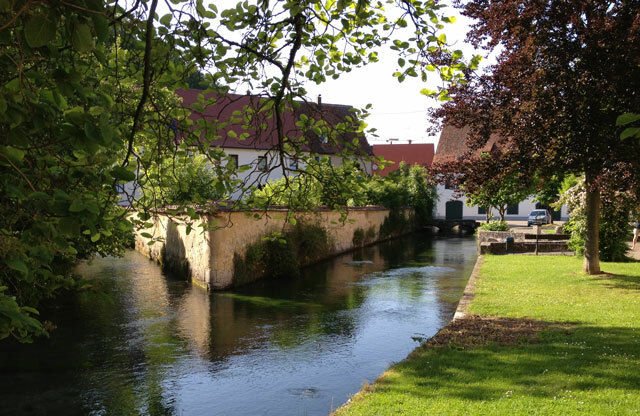 The village itself is very pretty and peaceful, especially with its little stream. After checking into Gasthof Sonne (sonne means sun) in Andelfingen, we change into cycling clothes and head for the Danube by car. We picnic before setting off on our bikes. We’re delighted to be in holiday mode so soon. We pass several villages with their clean white houses and church spires along the path. 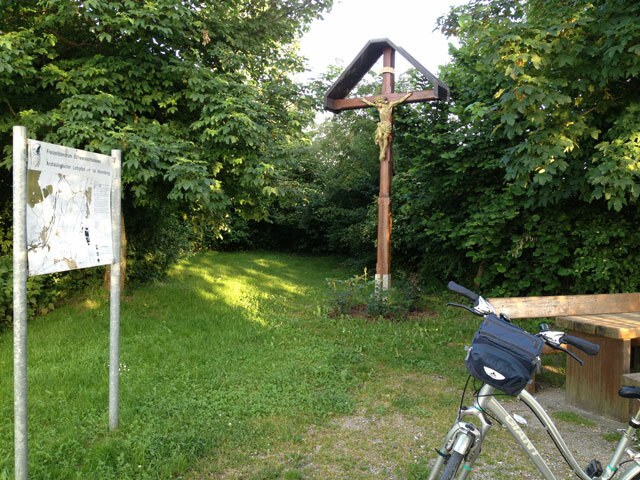 We’re amazed at the number of crosses along the way as well, often next to picnic tables. 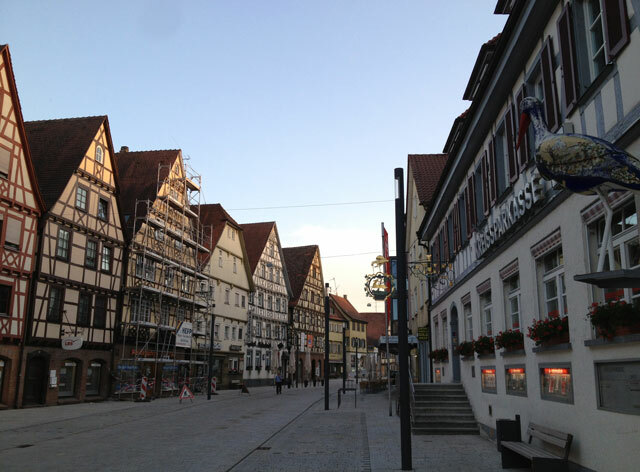 Fifteen kilometers later, we arrive at Mengen, a quaint little town with a tall spire, many colourful half-timbered houses, one of which was built in 1596. They have a number of very large storks on the buildings which intrigues us. Many of the shop windows also have dummies dressed as soldiers in traditional garb, including a a surprising Beefeater but I stupidly forget to take a photo. By the time we start on our way back, the light is waning and we reach the car just before it gets dark. As soon as we open the door to Gastof Sonne, we are greeted by welcome coolness. One thing I did not worry about when booking our accommodation was air conditioning and I was afraid we were in for a sleepless night! We need to be fit for tomorrow’s 40 K! 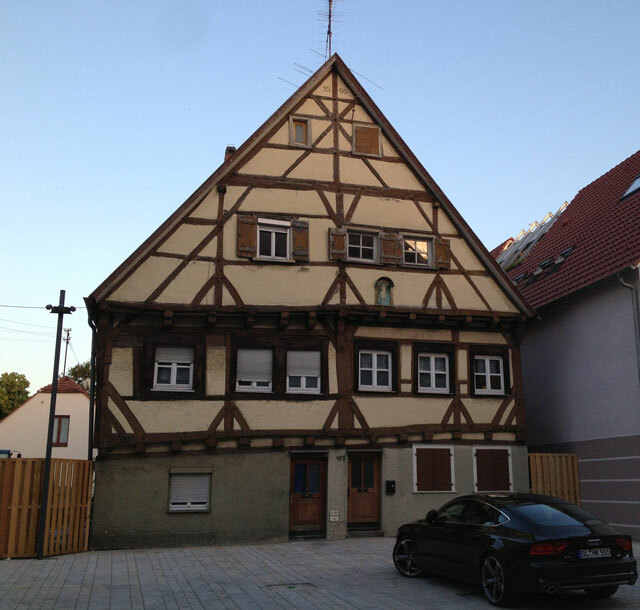 This entry was posted in Architecture, Cycling, Germany and tagged andelfingen, cycling, danube, mengen. Bookmark the permalink. That’s rococco for you — classical taste and simplicity on the outside and outrageous more is more on the inside. I love it! I agree! It’s amazing when you walk inside.